JAMES W. ROBINSON. A privilege that but few are spared to enjoy is that of having witnessed the birth of the nineteenth century and to still live to join in the celebration of the fourth century of the discovery of this land, which is the home of freedom and equality. Mr. Robinson is one of the rare individuals whose experience extends over this long space of years, he now being in his ninety-third year. 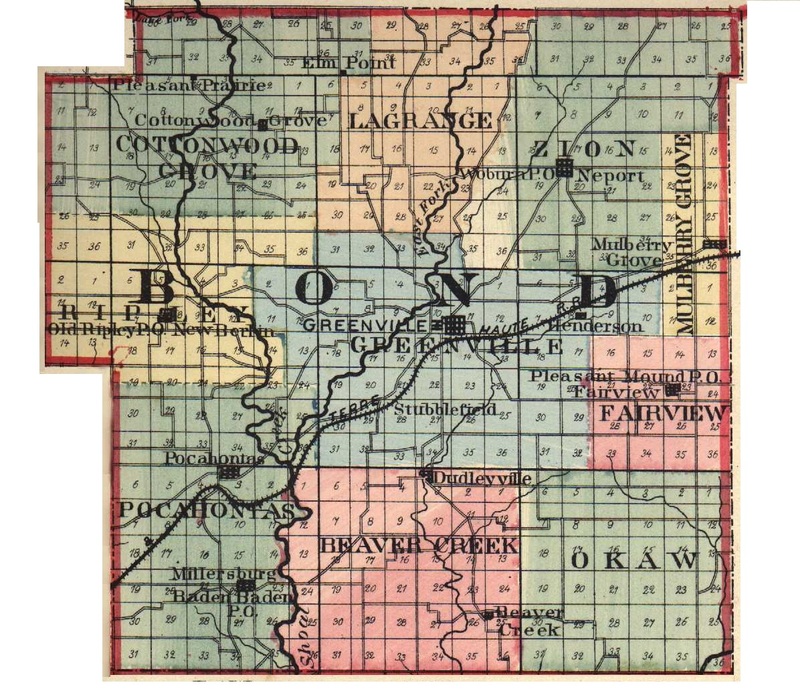 He is one of the pioneers of Bond County and is as conversant with the history and development of Illinois as any man now living. He was born in Lincoln County, N. C., March 14, 1800, and is a son of Alexander and Martha Elizabeth (White) Robinson. His father was also born in North Carolina and was the son of Alexander Robinson, a native of Ireland, who came to America in the early part of 1700. In 1812, the Robinson family went to Tennessee, and in 1816 our subject came to Illinois. After harvesting a trial crop in Madison County, he brought on his family and stayed one year in that locality. He then came to Bond County and settled on land not far from where Reno is now located, the land still being in the possession of our subject. There his parents died. Of the three brothers and three sisters that he had, none are living. James W. Robinson was married December 31, 1831, to Catherine Hess, a native of the State of Ohio. Their companionship was of only two years' duration, her decease occurring July 11, 1833. She left to her husband one son, Alexander S., who on reaching manhood gave his life for his country, dying in Libby Prison, January 20, 1864. Our subject again married, February 12, 1835, his bride being Miss Polly Ann Armstrong. She survived until December 27, 1889, and on her death left two children, Mary E., the widow of Milton Rosebrough, who lives near Valley Falls, Kan., and Elvira, the wife of H. M. Ferguson, at whose home our subject is pleasantly passing the latter years of his life. Mr. Robinson inherits his principles in politics from a long line of Whig ancestors, and has voted the Republican ticket ever since the organization of that party. He has been a life-long member of the Presbyterian Church, and for many years has served as Elder. Mr. Robinson is a vigorous and hale old gentleman who retains his faculties remarkably and bids fair to welcome in the twentieth century. Extracted 20 Dec 2016 by Norma Hass from 1892 Portrait and Biographical Record of Montgomery and Bond Counties, Illinois, pages 280-281.